Many local and international universities have study abroad or practical excursion programmes for their students’ benefit. A number of these universities have over the years visited the Southern African Wildlife College (SAWC) for educational exposure, which given its prime location and accommodation offering within the Greater Kruger National Park, is able to give students a really top-drawer hands-on learning experience. The College has also now built up a wide network of relationships with stakeholders in the region, that links in with its own set of expertise, so that it can offer tailor made programmes based on the differing needs of Universities across the world. “Due to the diversity of training we offer, which is based on the needs of the industry, the College has become a sought after destination for universities and other tertiary institutions that want to get a real understanding of the realities of natural resource management on the ground,” says Marilize van der Walt who manages the College’s University programmes. “After building up some momentum over the years, it is from this diverse set of training that our Skills Practitioner Master Classes were born,” she added. 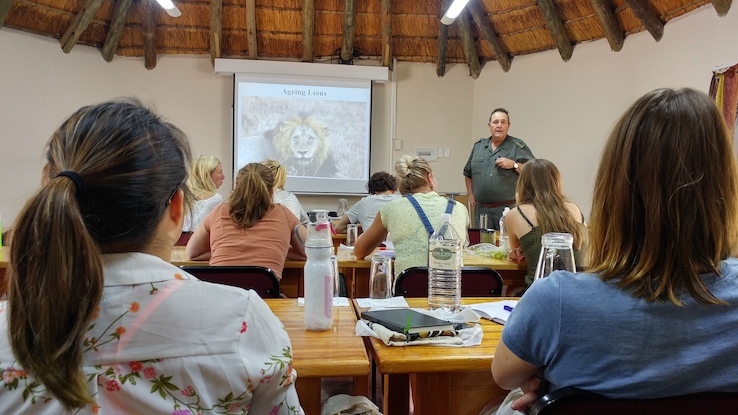 These classes are focussed on nature and conservation and can be themed around any of the SAWC’s focus areas whilst also harnessing the expertise of some of our visiting lecturers and other stakeholders. The classes range from 1.5 hour talks to tailor-made day programmes, which include site visits in most cases. Under the leadership of Dr. Maarten Schrama, Leiden University, Netherlands an international group of students visited the College earlier this year. Here he pens down some insights into their visit. “Early in January 2018, an international group of students visited the Southern African Wildlife College for a field course revolving around the topics of biodiversity conservation, disease ecology and management, and sustainable livelihoods. 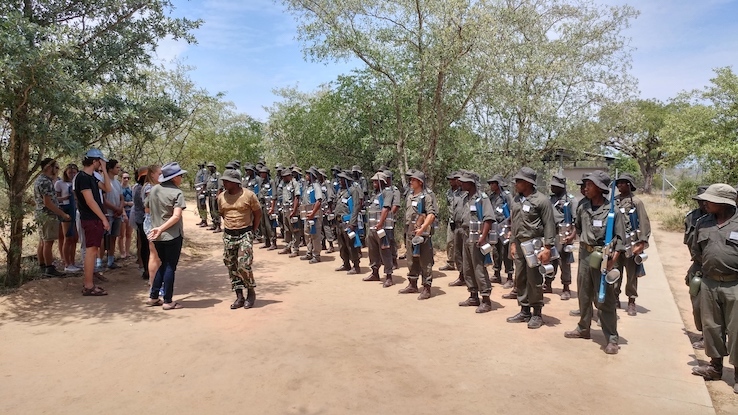 The aim of this course was to provide an in-depth understanding of savanna conservation including the importance and difficulties of conservation. The students came from a variety of disciplines, varying from political sciences and civil engineering to the biological sciences. The course was organized by the SAWC, the University of Leiden and Utrecht (the Netherlands), in collaboration with teachers from Oregon State and Colorado State University (USA). Course students came from a highly international background, including the Netherlands, South Africa, Zimbabwe, Serbia and Italy. The first part of the course focused mainly on the biodiversity aspects. 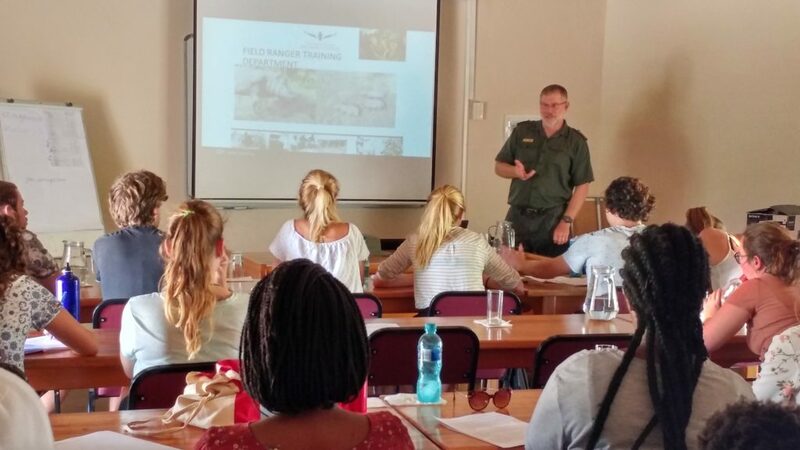 A great introductory talk was given by Dr. Cleo Graf from the College – which was followed by a 3-day visit to the Kruger National Park, guided by Prof. Joris Cromsigt and Dr. Mariska te Beest, and hosted by the Organization of Tropical Studies (OTS). There were some spectacular experiences in the Kruger including sundowners at Lake Panic, as well as a number of interesting and in-depth lectures from rhino specialists, disease specialists – together with many field excursions. After a well-deserved day off, which was spent tubing and boating in Blyde River Canyon, the second part of the course started – and changed gears. This part focused on the socio-ecological challenges related to biodiversity conservation and management of foot and mouth disease, bovine tuberculosis other diseases that travel across the park fence. There were a number of great lectures by park and state veterinarians, disease ecologists Dr. Erin Gorsich and Dr. Bree Beechler, followed by three days with lectures on conservation hunting and poaching issues. These lectures were delivered by Dr. Kevin Robertson, Ruben de Kock, Lerato Khatoli and Skhumbuzo Mdletshe. The remainder of the course was spent on group projects, in which students were encouraged to think of innovative solutions to some of the problems they’d observed or heard about during this course. The presentation of these projects resulted in some very spirited and interesting discussions – and a great farewell party afterwards. In the coming four months, the College will be hosting the University of Mpumalanga, Southern Utah University, Texas A&M University, University of Florida, Sierra Nevada College, University of Queensland, Rhodes University, University of Indiana and the Michigan State University who will be conducting their educational excursions. More on these visits in the upcoming issues of the Bateleur. In conclusion, every university engaging the College has a specific focus to their excursion, which is applicable to their own university’s curricula and length of stay. “We are able to assist any university with a tailor-made programme suited to their needs and the themes they wish to address within the scope of expertise we work with daily,” says Marilize van der Walt. To learn more about what the College is able to offer in terms of its University Programmes, Short Courses and Skills Practitioner Master Classes, please contact her at marvdw@sawc.org.za.